I originally was trying to enlist in the Air Force. However, I knew that my draft was getting rather close and saw the sign for US Coast Guard Recruiting in the hall. 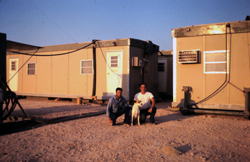 I sat down and talked with the OIC of the office and was enlisted two weeks later. The recruiter told me that I would not have to take a bus to Alameda for boot camp. He had sailed near the Cutter Eagle and never had a chance to go aboard. He said the ship was coming into San Francisco on my enlistment day and he was going to drive me down. When we arrived the ship was just coming into the bay. We watched as she moored and he knew a couple of Chiefs on board. We got invited to the Chiefs Mess for lunch. Damn, I thought, this outfit was great. Steak and baked potatoes and all the fixin’s and to boot, being served by the Cadets. And finally being called Sir. Had a great tour of the ship. After I had been to Vietnam in 1968, I decided to stay for a career. 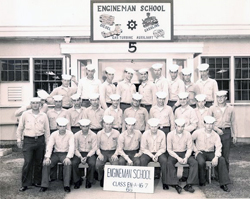 Since I had done a lot of mechanical work prior to my graduation from HS, I had made up my mind that I was going to be an Engineman (EN). While assigned to HQ I was promoted to MKC, Sep 1974. Then due to my assignment in Washington DC and had some good references, I decided to attempt to go into the Warrant Officer group. I was lucky and made CWO2(ENG) within 12 years. I tried to get assigned to a ship and had orders to a 378 in Hawaii. The District Commander did not like a boot Warrant without any sea duty (or as little as I had) to be assigned to a cutter in his district. I finally ended up at Group Shinnecock, NY as GRUEO. 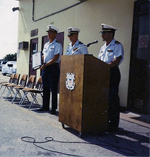 Got reassigned to HQ in Jun 1981 and finally ended up as a GRUEO in Mayport FL. I retired in Sep 1989. As stated previously I was stationed on board the USCGC Point Grace (WPB82323) Mar 18, 1968. 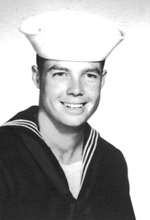 I remained aboard for my entire tour and the Division Commander approved an early rotation stateside Feb 18, 1969. 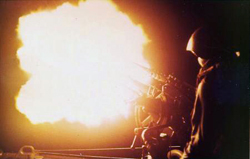 We were in combat an average of at least once a month and participated in the largest Naval action on a direct target when the CGC Bibb (WHEC31), CGC Point Cypress (WPB82327), 8 Navy PCF’s, 4 Navy LCVP’s, the USS Washoe County (LSMR1165) and all the SEALs in Vietnam attacked Viet Cong and North Vietnamese Army entrenchments along both side of the Song Bo De in IV Corps Area. This river had a reputation for not allowing friendly vessels to infiltrate without causing serious casualties. The river banks were covered with steel reinforced bunkers built by the Japanese during WWII. The SEALs duty was to infiltrate and destroy the bunkers and remove as many of the enemy as possible. What they couldn’t blow-up, they booby-trapped. The area was decimated to a point that no further damages were encountered subsequent to this action. I put my two duties, at Vietnam and LORSTA Lampedusa as my fondest. I “grew up” in Vietnam and while at Lampedusa under the tutelage of a great MKCM. I attribute his teachings that enabled me to pass service wide exams for promotion to MKC and CWO. We had some great times at Lampedusa and the station quickly had a positive reputation for the least outages and one time was used as a homing beacon for one of the Apollo missions to the moon. The island had approximately 4500 indigenous people and the island had been occupied for over 2000 years. It is about 150 miles South of Sicily and 60 miles from the North African coast. They were starting to regenerate their forest. During WWII, the Italians had huge gun emplacements on the North cliffs and were used to shell Allied convoys enroute to Malta. 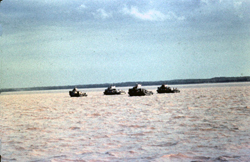 When the allies overran the Italians on the island, they did not leave any fuel for generators or for cooking. The locals burned all the vegetation for charcoal to cook with. We had several locations on the island that had great beaches and outcroppings that we used for recreation and the town was just beginning its movement to tourism. We had two recreational one person sailboats for use and we would sail around the island or to out of the way beaches and snorkeling. The weather was great most of the time. In March the temperature would climb to over 100-degrees F in the shade. During the winter the lowest temperature we had was about 35-degrees F. However, we would experience sand storms from the desert with more than 60 MPH winds. First duty that impacted me the most was during my first station. I had two good mentors that helped me learn about diesel engines. I had never worked on one before and they nurtured me along and caused me to understand that my knowledge of situations peaked and I really began to question the what, who and why of the Coast Guard. My time in Vietnam caused my interest in other people of the world in how they lived and thought. We had a Vietnam Navy liaison that spoke English fluently and was able to explain the living habits of the locals and how they lived on the boats. He invited a few of us to come to his house and “have dinner”. I found this very interesting and peaked my interest even further. My duty there was one of the reasons I applied for my duty to Italy. During my stay in Italy, I was able to tour Rome, Isle of Capri, Pompeii and all of Sicily. Again, this caused me want to learn more about history of the world. I had been an “amateur” historian since I was in grade school and had a huge yearning to learn. MKCM Tribeck on Lampedusa taught me how to teach others. I used his methodology while in the Coast Guard and during my subsequent jobs as a civilian. I have passed this on to my staffs as I moved on to other assignments and still use it today. 1. I note with pride and am pleased to commend you for your performance of duty from July 1985 to June 1989 while assigned as Engineer Officer, Coast Guard Group Mayport, Florida. 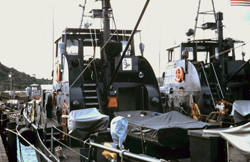 Demonstrating exceptional professional competence, you developed a comprehensive Group Hazardous Waste Contingency Plan that brought Group Mayport into compliance with state and federal regulations. The plan was adopted by Coast Guard Headquarters as the training model for shore units nationwide. You also oversaw the six-month yard availability for USCGC POINT ROBERTS, one of the most extensive and costly for an 82 foot patrol boat in recent years. You were responsible for the complete restoration of the Amelia Island Lighthouse, returning it to absolute pristine appearance and structural soundness. To facilitate assignment of a 11O-foot patrol boat to Station Port Canaveral, you were tasked with completely replacing the station’s pier and boat docks. Since contracting out the project was cost prohibitive, you utilized Group resources, completing the work on schedule and at enormous savings to the Coast Guard. You initiated major repairs to USCGC HAMMER’s crane, averting a potentially serious safety hazard. You expertly managed the Group-wide small boat haul-out program. During mobilization exercise Ocean Safari, you successfully established a security force that was impenetrable by opposition forces. As Morale Officer, you organized Coast Guard Day activities that promoted the Coast Guard family concept throughout Northeast Florida. 2. You are commended for your outstanding performance of duty. By your meritorious service you have upheld the highest traditions of the United States Coast Guard. 3. 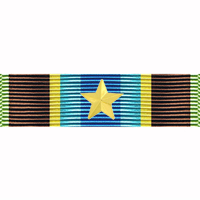 You are hereby authorized to wear the Commandant’s Letter of Commendation Ribbon Bar (gold star in lieu of a second). MKCM Tribeck, Lampedusa; CWO4(PERS) Richard B Milne, Mentor and best friend to this day. While in Vietnam, we competed with the PCF Squadron about skiing. We first learned how to ski behind the 13 foot Boston Whaler using a 35 HP kicker. The Navy guys showed how to do it behind the 50-foot PCF. After some time, we learned a way to get behind the Point Grace and showed them how it was done. The local islanders had a huge laugh with us. After I retired I worked for a couple of local environmental cleanup companies. This required me to learn more about hydrology and chemicals. After a couple of years, I was able to join Marine Spill Response Corporation in Lake Charles, LA. I was assigned as the Logistics/Maintenance Supervisor. I spent 2 years working in Lake Charles and learned the “catastrophic” oil spill business. I stayed with the company and was moved to Miami as the Maintenance Supervisor. 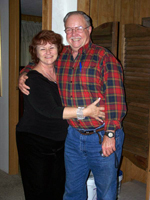 Mr. Wayne Rhoades was the Logistics/Maintenance Supervisor in Miami and the L&M Manager split up the responsibilities. Wayne and I switched our duties after about 6 months and I ended up as the Logistics Supervisor. My duties included making sure equipment inventory was up to date on the computer system for all sites within our Region. This included, Miami, Jacksonville, Tampa, Savannah and St Croix, VI. We put all our equipment into shipping “packages” with the equipment, manuals, spare parts, safety equipment, etc. They were set up to be shipped via truck, ship or aircraft. I was later assigned as the Site Supervisor for Tampa with one other employee as an assistant Jan 1999. I remained with MSRC until 2006 (almost 15 years) and due to a medical situation, I was forced to fully retire. I am presently retired and have returned to my home in California. Military Officers Association., American Legion, Veterans of Foreign Wars, Vietnam Veterans of America, Disabled American Veterans, Chief Warrant and Warrant Officers Association, Coast Guard CPO Association., Coast Guard Combat Veterans Association, and several other organizations. I learned a lot about leadership and how to deal with all sorts of personalities. This was very greatly used during my following career with the private company personnel. “Stay with it and go all the Way”. Retire! It has helped me to find some friends I served with and thank you for helping to put some organization to my record.